Business consultants showcase how uncovering unwritten ground rules can transform a company’s culture in this debut fable. Bruce Bottomline, chief operating officer of Australia-based Very Important Corporation, has missed his flight to join his wife in Hawaii in time for their anniversary. He’s stressed out about his company, founded with CEO Helen Hardcharger 20 years ago, including that it has just lost a major client, share price is slipping, and there’s a rumor that its “hotshot young consultant” will exercise his option to leave. Onboard the next flight, Bruce meets Sam Sherlock, a retired consultant who advises on how to fix things. Returning from his trip, Bruce implements Sam’s process, with the critical first step being a buy-in from Helen, who becomes increasingly aware of the quelling effect that she’s had on others. Meetings are then held to tackle the company’s unwritten ground rules (UGRs), the “undiscussed rules that actually drive behaviour in organisations...people’s perceptions of ‘the way we do things around here.’ ” “Around here” is used as a lead-in to write out current UGRs, then all get involved in “creating and prioritizing aspirational, positive UGRs—linked to the KCAs or Key Cultural Attributes or value statements—by which they would like to characterise the organization into the future.” By fable’s end, employees are reinvigorated, particularly because bad-attitude workers are given the boot, and Helen tells Bruce to leave the office and enjoy a vacation. Simpson and du Plessis, business consultants based in Australia and South Africa, respectively, put forth a clever idea in this book—to look at the “real” rules at play in a company and rework these rather than impose lofty new “values” from above, which are quite rightly often greeted with cynicism by employees. Placing this process within a fictional story efficiently highlights how UGR activity can be an engaging exercise for teams. The narrative gets a bit pedantic by also introducing a KCA concept (aren’t KCAs just good UGRs?) and describing this a bit intimidatingly as a five-step process to Envision, Assess, Teach, Involve, and Embed. But overall, this volume presents an illuminating, mobilizing concept. 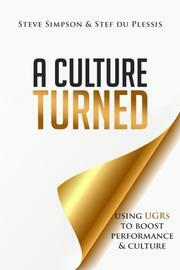 A book that delivers an effective approach to leveraging a company’s underlying precepts.